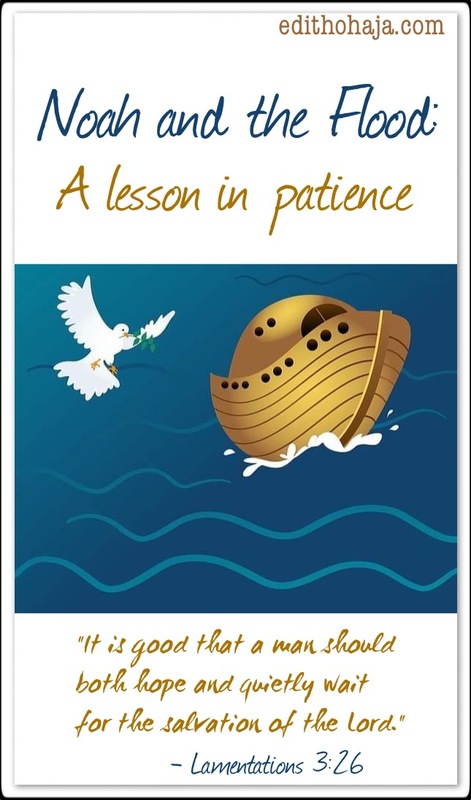 I learnt a sobering lesson about patience recently as I read the account of Noah and the flood in the biblical book of Genesis. We know the summary of the story: The world was steeped in sin but Noah was righteous. When God couldn’t take humanity’s evil anymore, He asked Noah to build an ark in which his family and several pairs of all kinds of animals could be saved. On the appointed day, they entered the ark and God unleashed an unprecedented flood that wiped out all living things. Then Noah and his company came out of the ark, which had floated on the waters till the earth was dry, to multiply and replenish the living species on earth. Neat story, right? Awesome! Except that as I read the details, I wondered how Noah and his group ‘endured’ the experience. Yes, ‘endured’! Their lives were being saved quite alright but if they were anything like me, it wouldn’t have been easy for them. As I reflected on this, I was reminded once again that anyone who wants to walk with God must learn to wait, to be calm and give God time to do what He intends to do. But frankly, sometimes, waiting seems to be the hardest thing to do! Let’s go through the story again bit by bit and you’ll see what I’m talking about. You’ll see how the patience of Noah and his family could nave been stretched as God delivered them. The actual rains and water from beneath the earth popping up lasted just forty days. (I say ‘just’ in relation to the time that elapsed before Noah and the rest were able to set foot outside the ark.) The deluge began on the seventeenth day of the second month of Noah’s six hundredth year. By then, Noah and his family had already spent seven days in the ark. The flood precipitated by the deluge would naturally take much longer to dry because the account says that the mountains were submerged by over twenty feet of water. We were first told in chapter 7, verse 24 that the floods surged for a hundred and fifty days (about five months). Now I don’t believe that Noah and his family were anything but grateful while the downpour occurred. Every other living thing had died but they were safe in the ark buoyed up by the waters. They must have thanked God endlessly and might have continued in the first month after the rains stopped. But as days turned into weeks and weeks turned into months, I wonder if they had got restless. I would have. Yet, even after the five months, they still didn’t have permission to leave the ark. Why? The flood was still drying up and had a long way to go. They weren’t going to live at the mountaintop. The rest of the earth needed to dry too. This was a natural process and it seemed to be taking forever. I wonder if they asked God to speed things up at some point. I know I would have. They waited another forty days and Noah opened a window for a peep. He sent out a raven and a dove to see how things were. The dove came back because the earth wasn’t quite dry. After seven days, Noah sent the dove out again and what a celebration he and his company must have had when it returned. But the wait wasn’t quite over yet. Now a flood that massive would have turned the ground to mush. It wouldn’t make sense to come out and break their limbs or catch an infection after waiting so long. “Let’s give it another week,” he must have said to the rest of the family, who had gathered round. I wonder if they groaned. That’s the thing about waiting. You can be serene and take it all with equanimity until it’s approaching time for the wait to end, then you just can’t take it anymore. Perhaps, they suggested they’d prefer to take their chances outside than remaining cooped up in the ark for one moment longer. This reminds me of the folk tale about the tortoise in a pit. All the time he was there, no one heard from him. But on the day he was to be pulled out, he urged those to do the job to hurry up because he couldn’t stand the stink down there any longer. Anyway, seven days later, Noah sent out the dove for the third time but it didn’t return (v. 12), probably because it could fend for itself. You would think that everyone will be filing out from the ark at this point. But, no! From the time the dove left and Noah uncovered the ark, he and his company spent another fifty-seven days inside until God directed them to come out. Wheeew! You are not safe until God says you are safe. Things may look okay to you, but you still need God to say, “Move”, before you do. Altogether, Noah and others spent three hundred and eighty-two days (that is, about twelve and half months) in the ark to be delivered from a forty-day flood. Can you beat that? So, next time God assures you He has taken care of a problem but you still see yourself stuck or constrained by the circumstances created by the problem, don’t doubt Him or bellyache. 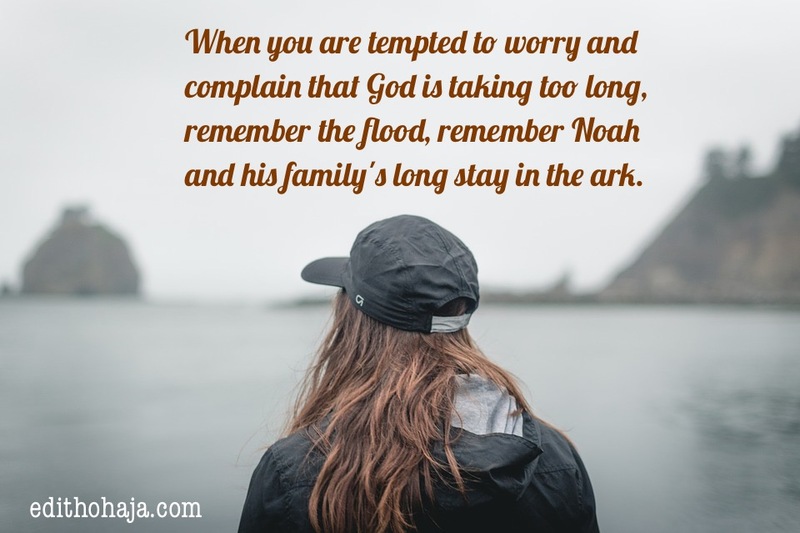 When you’re tempted to fret and complain that God is taking too long, remember the flood, remember Noah and his family in the ark. I would imagine that Noah and his family devised means to keep themselves busy in the ark. They would have realised that worrying won’t make the time go faster and that harassing God won’t do it either. In the same way, allow God to guide you into some creative ways to spend your time in the wait. Don’t allow the enemy to turn you against God when He’s actually perfecting your miracle. Thank Him and listen closely to His signal before concluding that the wait is over. May the Lord bless you as you bear the fruit of patience in major and minor issues of your life as you daily walk with Him in Jesus’ name. Hallelujah. Praise God! Waiting is indeed difficult and it truly takes Patience, a direct work of the Holy Spirit in the heart of the believer to remain in line with God until the morning, when Joy comes. Thanks, Oluwaseyitan. God bless you! Patience is truly a virtue we all should possess. I doubt if I have such patience but I pray God puts it in our hearts to have such patience. I cannot even imagine how it'd have felt... The long days they had to stay but many and even me would wait just few days and if God does not answer we frown and look for easier ways as we feel is right God help us! Amen. Happy a great week, Chinonye! This post is specifically written for me... the story of the tortoise is the appropriate illustration to drive the issue of patience home.Thank you ma for using this piece to uplift my spirit. Praise God you were blessed, Obianuju. It is well with you in Jesus' name. Patience is the key.when all seems bleak its best to keep pushing and waiting for the perfect time.Thank you ma.Have a wonderful week. Thanks and have a great week too. Wonderfully written Edith Ugochi Ohaja.it is so true, at the end of waiting, we can get so impatient..like the last lap becomes suddenly too much..never thought of the patience of Noah..you brought it out so well. Thanks a lot for dropping by, Rita! I'm glad you were blessed by the post. You're such a wonderful friend and I'll be sure to return the love in the near future. Ma! 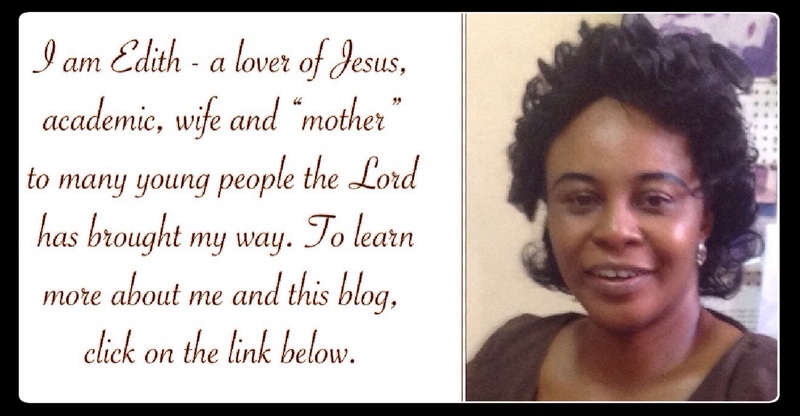 Your write-up about Noah is quite inspirational...I really learnt alot from it... Previously, I used to read Noah's story just like that without digging deep .... I never really knew about the minute details talk more of its teachings on patience but because of this powerful write-up I've learnt how important it is to be patient even though it may not be easy. Thanks a lot Ma. I'm super grateful. Glory to God! You're highly blessed in Jesus' name, Stephanie! I think this post was meant for me because I'm impatient most times. They waited for many days, but as for me, I don't think I can wait that long. Patience is a virtue we all need to possess. I think it's natural to be impatient but God can help us bear the fruit of patience by His Spirit. Patience is a virtue they say... The journey with God needs the fuel of patience for a smooth ride. Everyone that walked with God successfully in the Bible had it. It is all about the ability to trust God for who He is and what He says despite anything contrary, and that settles the whole matter...Though, not as easy as it sounds. Nice comment, Chidiebube. It may not be easy but we receive God's grace for it when we place ourselves in Gods hands. The story of Noah holds so many good lessons! The patience and trust He had for God is something I would like! I must confess Noah was really patient. I doubt I will be able to do such! Glory to God for Noah's patience. Who knows if the human race would have continued? Patience is a good virtue we all should crave for. May we all imbibe this wonderful virtue. Bless u ma for reminding us of the need to be patient. May God bless you richly too, Daniel, in Jesus' name. Truely,Noah lived an examplary life for Christians to follow.By faith he remained faithful to God.Thanks for keeping men spiritually alert. God bless you more. This story is one of the stories I go through in the Bible when am down. Noah is among the top list of leaders that we should always look up to for example because he lived the way God wants us to live our lives but we are human so we just pray for God to help us to lengthen our patience so we will not rush things, because God's time is the best. Insightful. I never understood that passage from this perspective. As i read the post, the scales in my eyes fell off! By the spirit of God upon Noah, he became so faithful and trusted in God. when the spirit is upon you, it means you are a winner, and will conquer impatience and other enemies of a living soul. Patience is a virtue we lack in this our generation and I think that is why we hardly witness Gods move in this our dispensation cos we are always in a hurry for God to do miracles and answer us immediately we call, not knowing that we have to go through some difficulties or tests before we get what we want. Patience is one virtue I know is difficult working with as everyone is in a rush but as they say, the patient dog eats the fattest bone. Obedience, patience and humility are the features which everyone is supposed to possess in life. You are really inspiring us. I enjoyed this story very much because in our life today, most of us always rush things. What is supposed to happen in two to four years, we want it to happen today which is very wrong because the word of God says that," Whoever is slow to anger has great understanding, but he who has a hasty temper exalts folly" (Proverbs 14:29). We really have to apply patience in all that we do because with it we can achieve many things. Impatience leads people to a dangerous path. Thanks so much for this wonderful food you made for us. Patience is a virtue Christians must imbibe. Being patient is difficult, assuming noah was not obedient to God’s word, He would have perished alongside the rest. patience is important as seen in the article. I pray God helps us to have patience. Noah's flood serves as an example for us today in the matter of faith and a strong relationship with God. it was because of his faith that noah was able to survive the flood, though he had not ever seen anything as a flood covering the whole earth. he had faith, so we all can learn an example from this. Sometimes when we think our prayers are not getting answered, it's the same way Noah and his family thought God was taking too long. But if we look carefully, we would understand how compassionate God can be. Sometimes he doesn't answer immediately in order to save us from impending danger. Yes, waiting is the hardest thing to do. I can remember when I couldn't get admission in the 2015/2016 session, i was challenging God. God was testing my patience. Patience is a great virtue. Without patience, the disciples of Christ wouldn't have made it that far. Patience pays. Patience, a hard virtue but very important. at least, i know now that while things may seem not to be going my way, patience is key. My prayer about this story is that God should give me a faith like that of Noah and his family who obeyed God even though during his time according to bible there was nothing like dews let anlone having a rain fall but yet when God spoke to him with no doubt he believe and made the ark together with his family in accordance with the accurate requirement even though God wasn't there to direct him but he made it in accordance with the instruction. But I have a logical question which is, where did the dove he sent to spy the earth gets the olive leaf since the entire earth was still at least covered with water. That was towards the end of the story. The water had reduced substantially then, so it was possible for some plants and vegetation to be sprouting. Bless you! God requires patient people to work with them. Patience is not just by talking, it needs practicality. Noah exercised patience and God delivered him and his household from destruction. Yes patience is indeed key to success for those who can wait for God's time. I am highly motivated by the teaching, ma. Patience as a virtue is not what we do now,we all are in the rush to get what we want,we forget that endurance has its greater benefits. God has a purpose for everything he does for his children irrespective of the sins they have committed No one has that endurance to stay locked up for months, its way impossible, I won't be able to do that but Noah's story has taught a great lesson. "Now faith is the substance of things hoped for, the evidence of things not seen"_Hebrews 11:1 The thing about God is that he love to wait, watch and know where we stand. He expects us to be patient just as he himself is patient. We should never doubt God; if He puts us in the ark, he will surely bring us out; it is impossible to please God without faith (Hebrews 11:6) and what is faith without patience. No wonder the bible said: "By faith Noah, being warned of God of things not seen as yet, moved with fear, prepared an ark to the saving of his house; by the which he condemned the world, and became heir of the righteousness which is by faith. "_Hebrews 11:7 Wonderful post indeed. patience is a virtue. i pray God give us the grace of possessing this excellent virtue. thanks, ma, for this wonderful article. thumbs up! Patience has always been a huge task for man. Its worse when you can see no sign of what you are waiting for, but the wait is always worth it if we endure. Patience is both a virtue and a gift that we must endeavor to practice always. Well said ma, we should strive to cultivate the habit of patient as seen in Noah's story because God might be preparing us for something greater and there is need to avoid murmuring,nagging,complain etc because it hinders us from harnessing the blessing God has in reserve for us. During my childhood, Noah and the ark was a popular story taught in Sunday school. I never knew it has more to it than just how God destroyed the earth with flood. This beautifully written piece has made me see the other side of this story which is PATIENCE : A Practical virtue. More grace. God is never late. At his time, at his pace is how He does it. When we cannot do much to fast track things, the best it to pray endurance. Who says that isn't a virtue? Patience is a virtue everyone should possess not only for times of trouble but for our everyday lives. To be able to tolerate people around us and any condition we find ourselves in. Beautiful ma'am! There is blessing in waiting. It is even more beautiful when it is done without murmur or complaints. And I realize it takes an incredible amount of faith and confidence in God to wait, a level you get to with God that you have this assurance that what ever he desires me to do, No matter how long it takes, No matter what it will cost me, so long as God is the one involved, it is worth it, I have no fears at all, nothing can spoil! So aside patience now on Noah's side, I see a man who trusts God with reckless abandon, one who believes God can't just abandon me here, if he decides to take his time, I am fine with it. I pray we Christians imbibe this beautiful attributes in our daily lives and relationship with God. This write up is superb!!! the main idea here is to be patient and also to endure in any circumstance as far as you are a child of God he is always going to be with us. This story really inspires me. There is a saying that the patient dog eats the fattest bone. Therefore we should strive to be patient even though it may not be easy. We should always remember that patience is a virtue. Noah is an exemplary leader that exhibits the major thing that God wants from man. Which is "patience". It's an illustration for us, the living ones to emulate from his(Noah) attitude during the time of flooding in the world. Let's always wait patiently for God, he will fulfill our requests. You are right! When the wait is almost over, it becomes most unbearable. Reminds me of a saying I saw. I was something like "When you can't bear it anymore,it's almost over"
Honestly, I have never read the story of ''Noah and the ark'' through the lens of patience. Thank you, ma, for helping me see this story from another angle. I learnt a great deal. Patience is a virtue they say. It is not always easy to wait but if it is possible to, there is always a great gain. Wonderful write up ma. The need for patience cannot be overemphasized we should imbibe such attribute. Noah was really patient, it looks so hard but he did it due to his patience, he lived an exemplary life for Christians to follow. patience is an important virtue. The story of noah teaches us two crucial things in life: one, you have to be alert, keep listening to God all the time to know when His call of love comes as it did to Noah; second, you have to be patient while waiting for God to manifest his work in your life. The story of Noah holds alot of good lessons! .it takes an incredible amount of faith and confidence in God to wait, a level you get to with God that you have this assurance that what ever he desires me to do, I will do. It is most expepedient that at times when we face various trials and temptation we should be patient enough to stay in the ark, hear what God is saying and follow his instructions carefully, just like Noah, because worry and lack of patience is a sign of how little you trust this big God. Patience is one of the fruit of the holy spirit. Galatians 5:22. patience is what every believer must have or posses.it is often said that God time is the best. We need to be patient with God when asking for something. Patience is the key.I pray God give us his grace to be patient in life. Being patient absolutely pays a lot. Although not everyone one has such spirit in them( including myself ). I pray God gives us the grace to be patient with one another, with situations especially during time of temptations as it is being said that "a patient dog eats the fatest bone" . Patience is a fruit everyone must strive to bear inasmuch as it hurts to wait for so long with no answer. Noah is an example of a good leader. His story teaches us to be patient and to wait on God because God's time is the best. Reading this post just got me thinking how it must have been extremely tiring to stay in the ark for more than a year, this is indeed the grace of God upon Noah and his family. Patience is a good virtue. Many stories in the Bible including Noah' s story taught much on patience which we Christians need to learn and imitate from but we are always in a haste. God help us.